Two reoccurring themes in the Bible are the ideas of being faithful and being fruitful. We are to be faithful and fruitful. Furthermore, the command to “be faithful” appears in eight verses, as does the command to “be fruitful.” It seems that God wants us to be both faithful and fruitful. Jesus talks about being faithful and his parables support this. Don’t we all want to hear him say, “Well done good and faithful servant” (Matthew 25:23)? In the New Testament, the word faithful occurs most in the book of Revelation, both in some of the letters to the seven churches and in John’s vision where he commends God’s faithful witnesses. In the Old Testament, the book of Psalms tops all others with seventy-one mentions of the word faithful. Though some verses address God’s faithfulness to us, others talk about our faithfulness to him: a faithful servant, faithful people, faithful ones, and faithful to him and his covenant (that is, his commands, Psalm 78:36-37). We should note that the instruction to be fruitful in the Bible always relates to biological reproduction and the growth of a population. However, it isn’t a stretch to apply this metaphorically to other actions that produce spiritual growth, that is, spiritual fruit. Too often I’ve heard people who—after working hard to serve God but achieving little—shrug and say, “Well, at least I was faithful.” Yes, they were faithful, but they also failed. God doesn’t want us merely to be faithful, he wants us to produce fruit in the process. He wants us to be faithful and fruitful. Working hard and failing, is simply failing. Working hard and producing fruit is what God desires. James writes that faith without deeds (which we can call fruit) is dead (James 2:26). As we pursue God and seek to serve him, we must be fruitful and faithful. God expects nothing less. Patricia, thanks for the great example and thought-provoking question! I wonder if writing the book is being faithful and publishing the book is being fruitful. Then we trust God with the increase (1 Corinthians 3:6). A certain aspect of this teaching I find challenging. I think we have more control over the being faithful part. 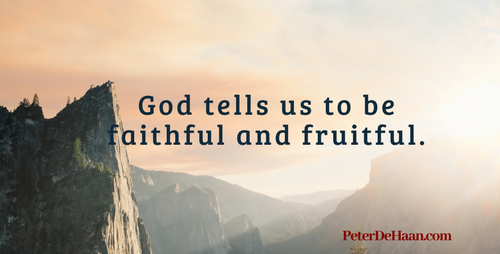 Producing fruit, however, requires God’s blessing on our faithfulness. It’s sometimes hard to discern if our efforts are making an eternal difference, if we’re expending our resources in fields that God has prepared for harvest. We don’t always get it right. Nevertheless, I think God is still pleased in our earnestness. Tim, you are so right. Thanks for providing some balance to the idea of producing fruit.